So I've wanted both of these for a while. They were worth the wait. Instant favourites. The Carcosa is brutal and surprisingly versatile. It can do pretty much everything you'd realistically want from a fuzz, and does that whole "dying battery" splattery sound too, if you set the controls right. The Ibanez is just a super nice analog delay. Niiiiiice, have had my eye out for a(n even) cheap(er) Carcosa for ages; seems flexible enough to make it a keeper. This thing has low-end out of wazoo. Not Woolly Mammoth levels, but definitely better than average. ProGuitarShop did about three videos of it I think, the main advert one and then two more showcasing more of the sounds it can do. It's actually a little wilder than I expected through my Ampeg. 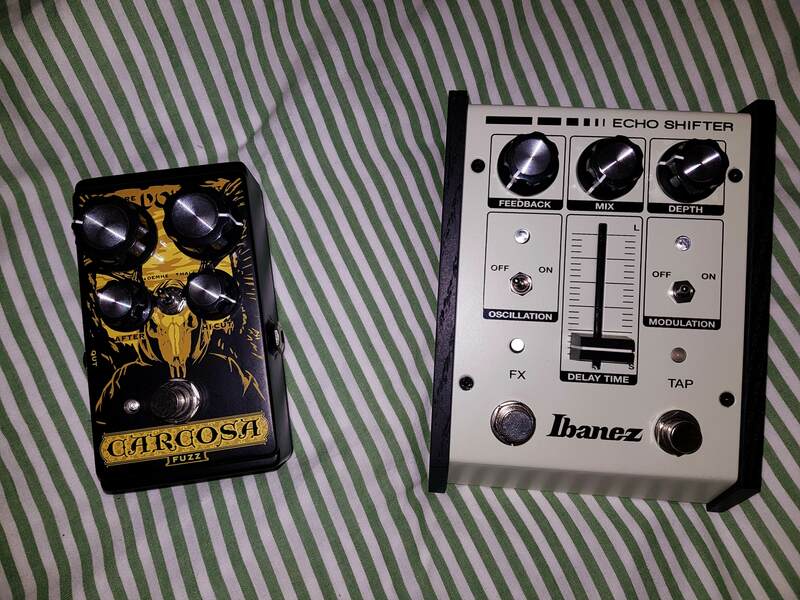 I love my Carcosa, I use it every once in a while when i want a ripping fuzz tone, it's fantastic.